Earlier this winter I asked Phil for advice regarding checking the centreboard pivot. I sail my Romilly (no 9) on the West Coast of Scotland, & I became concerned about the consequences of the pin wearing and ultimately breaking and the centreboard falling out ! Its lovely to be sailing in an area with hardly any other boats but….. 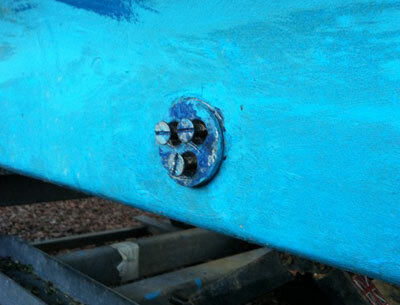 Step 1 Undo the three machine screws, on my boat this is on the Starboard side. Step 2 With the screws out the plate also comes away & you can see the end of the pivot pin. 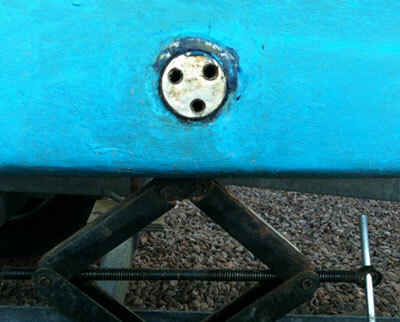 Before removing the pin I took the weight of the centreboard on a car jack. Step 3 Experiment with the load on the jack (initially I had the jack too tight which obviously made the pivot harder to get out). 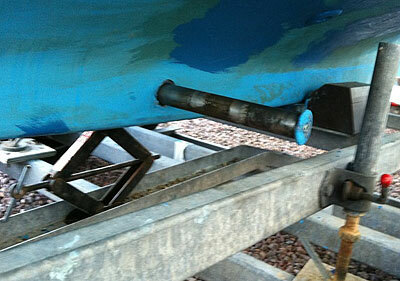 With the jack set to the correct load the pin came out very easily. Having tapped it half way out I was able to pull it out the rest of the way by hand. Step 4 The pivot was in perfect condition. The tolerances between the outside diameter of the pin and the Inside diameter of the hole were remarkably tight. The pivot had been greased by a previous owner and was still adequately greased a few years later. I didn’t measure the pin, but David Collin told me it was one and one eighth inch diameter, the flanges on each end are about 2 inch diameter. Step 5 Knowing the pin was in perfect condition I pushed it back in place – it’s a tight fit but being well greased I could just push it back without resorting to a hammer ! The whole operation took about half an hour. If I was to do it again it would take 10 minutes. I am now very confident that the weak link in the boat is the skipper & not the centreboard pivot !